Fit Rovers have made an exceptional start to the Club Doncaster boot drive which aims to provide boots to a local refugee football team by donating more than 50 pairs of astro trainers and football boots in one evening. The Fit Rovers vets have joined Doncaster Rovers and the Club Doncaster Foundation in supporting local football team Doncaster Conversation Club United (DCC United) which was set up to give asylum seekers and refugees access to team sports in Doncaster. 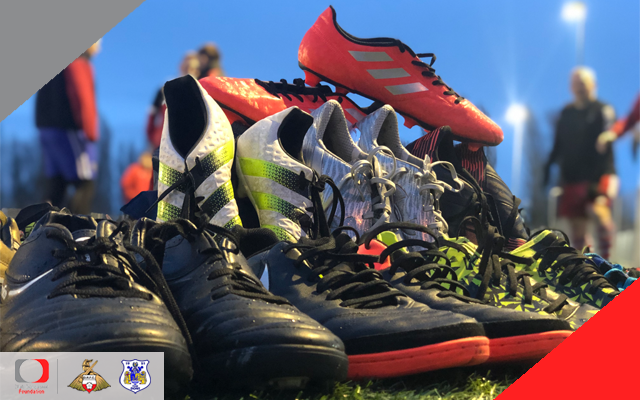 As well as donating their own unused shoes, Fit Rovers are now hosting a Boot Drive at both of Rovers remaining Saturday home matches on April 13 (Plymouth Argyle) and May 4 (Coventry). Supporters can also join the boot drive at Rovers final two Saturday games. The Fit Rovers vets will be based at each of the four corners of the stadium on the above dates and will provide drop-off points for supporters to donate astroturf trainers and football boots. Asylum seekers are granted a stay in the country while their case is looked at, if their case is approved, they will then reach refugee status but this can take years. Asylum seekers are not allowed to work and are given just £35 a week to live on, these conditions make it very difficult for people to enjoy playing and taking part in sport and Doncaster Rovers and Club Doncaster Foundation believe that sport and football is for everyone. Club Doncaster Foundation recognise the positive role that football can play in maintaining physical and mental health and helping with social integration. A number of partnerships between Club Doncaster Foundation and DCC United have been established to help with this.